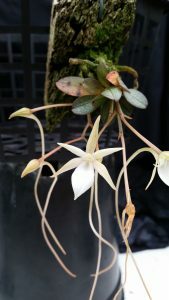 This is a warm growing, miniature species native to Madagascar and our smallest Aerangis species. The plants produce very large flowers for the size of the plant on spikes about 5cm long and bare 1-2 flowers during the summer. The flowers are short lived and are fragrant at night. The leaves are about 2cm long but the flowers are 5cm across with extraordinary 10cm spurs that carry the nectar for pollinating moths. I am delighted to report that the seed from last years flowering has germinated well in the propagation laboratory and we will have lots of these delightful miniatures ready to take out of flask (we will mount them from flask) in about twelve months.